Cardboard is the material for creating unique crafts! Home / Needlework / Cardboard crafts - ideal for family creativity! Cardboard crafts are ideal for family creativity! Cardboard is a universal material that allows developing creative abilities in adults and children. 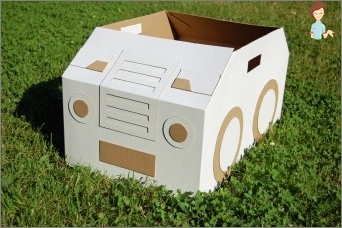 Find out what simple crafts can be made from cardboard boxes and corrugated cardboard! Is the grandiose holiday approaching? Thinking about what to please your family? To surprise friends and acquaintances will help everyone well-known cardboard. What can be done from ordinary cardboard? Yes, everything your heart desires! It will perfectly suit both for creating a gift box, and for making the presentation itself. It happens that some crafts made of cardboard are more aesthetic than purchased analogues. Initially, this material was created to protectGoods from damage during transportation. And today corrugated cardboard is very demanded for the creation of reliable packaging, but in recent years its scope has expanded significantly. I must say that a variety of crafts fromCorrugated cardboard is ideal for children's creativity, as the material is easy to bend, and it easily takes the shape the child needs. Buy some material and start creating a family of colorful cardboard products. A technique called "Tungsten"The most used for corrugated cardboard products. It is the twisting of strips of different density. Thus, spirals of different shapes and sizes are formed. With such curls, excellent three-dimensional flowers are obtained for appliqués. First, draw 15 petals on a colorCardboard, carve them. From the yellow and brown cardboard (corrugated) we cut out strips, the din of which should be 50 cm. So, to make a dome, we twist them together. From a piece of ordinary cardboard we cut out a circle with scissors 5 cm. By the diameter, we glue a toothpick, in a circle - petals. 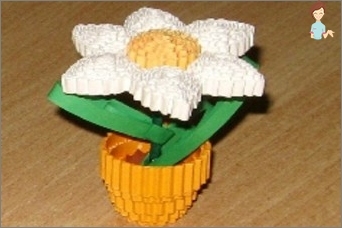 The next row of petals is attached over the previous one, slightly shifting the row to the side. Take green material, cut out 2 leaves, glue them to the stem. The flower is ready. Cut out a rectangle to create a postcard background and 2 strips half a centimeter wide (orange and green). We make the middle of the flower with the help of orange tape, as in the previous version of production. We fold a sheet of corrugated cardboard in the form of an accordion,Draw and cut out the petals. Chaotically paste them to the base, forming a flower. The green strip is folded to make a sheet, and glue at the bottom of the postcard. We fix the previously made middle. With ordinary colored paper, you can make a rectangle for the inscription "Congratulations! "And paste it in the lower right corner. If you help a child, it is quite possible to create a whole bouquet of such flowers. Only business this requires a lot of time and perseverance. There are many master classes to createQuilling solid figures. But this kind of creativity is complex, it is subject to the children of the older age category. Due to such properties as stability and strength, corrugated cardboard artifacts can stand for many years and look wonderful at the same time! But it is not necessary to buy specificallyMaterial for crafts. Mastering with children can be from what seems to be never useful, for example - from boxes of household appliances, chocolates, shoes and other household things. Today crafts from cardboard boxes are of interest to children no less than they once were. Yes, you can buy ready-made toys, but you can make them yourself - it's so exciting! People throw out a huge number of boxes. And just think about how much fun each child could bring to the children! You just need to show imagination and allow yourself to realize your childhood dreams. Great popularity among children is used by crafts made of colored cardboard of old boxes, designed in the form of household appliances: a cooker, a washing machine, a wardrobe or a cot for a doll. From large boxes everything will turn out beautiful andBelievable. And control panels with buttons and knobs can easily be drawn on cardboard, and even better will make them from old used CD-disks or disposable plastic cups. To make a cot for a doll not to be found betterMaterial than the shoe box. All you need is to cut out the edges. But to create a sink, it is enough to cut a circle in a large box and insert an iron bowl there. Still from the large boxes are magnificentCastle for princesses and knights, as well as houses for pets. From small you can create a whole town for dolls or parking for cars. In the latter case, the role of supports between floors will be well played by cardboard from rolls of toilet paper. To decorate such crafts from cardboard children really like. The main thing - to include the imagination, but it already tells you what and where to strengthen. For example, to make a typewriter for children,It is enough to cut off the top of the box, attach to it records instead of wheels, and plastic cups instead of headlights. Coloring everything well, we'll get a pretty pretty car. Cutting the front and back walls of the box,We get a wall aquarium. It is only at the top to cut several longitudinal strips, to thread a cardboard fish thread into each of them and fix it on top, tying it to the button. Thus, the inhabitants of the aquarium can be moved. In any case, to connect parts of almost all products need an adhesive gun. It will help to make all joints neat and not very noticeable. 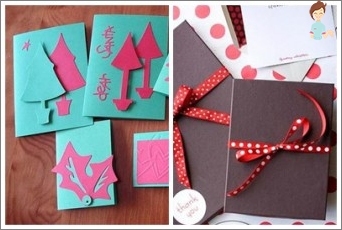 Create crafts from cardboard with your own hands very muchFun and exciting. They transfer to the world of childhood, where any trinket seemed an unprecedented treasure, and the usual cardboard box - a giant castle or a mysterious cave.